Kevin Garnett grabbed 13 rebounds to pass Shaquille O'Neal and move into 12th on the NBA's career list, and Paul Pierce scored seven of his 30 points in overtime on Tuesday to lead the Boston Celtics to a 97-92 victory over the Houston Rockets. Boston has won five straight since the All-Star break, including two in a row in overtime. Houston has lost four in a row. 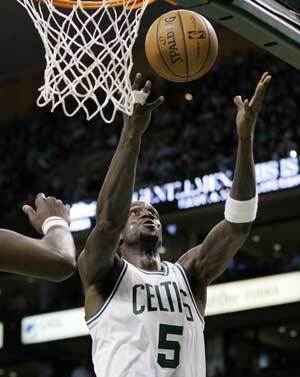 Ray Allen scored 21, including a 3-pointer with 36 seconds left in the fourth quarter to give Boston the lead. But Rajon Rondo missed an open layup with a chance to clinch it in regulation, and Goran Dragic tied it for the Rockets. Luis Scola had 18 points and 14 rebounds, and Samuel Dalembert had 11 points and 17 boards for Houston.